With months of summer behind us now, I've had a good chance to spend time at each of the four beaches in the immediate St. Joseph area as well as the south beach at South Haven. So this will be "Beach Week" here on the Discover St. Joseph blog and each day I'll share with you what I've observed about each beach. If you're a beach lover like I am, you're in for a treat! Without a doubt the most popular beach in the St. Joseph area is Silver Beach. It's the one you see from Lake Bluff Park in downtown St. Joe. Silver Beach, which used to be the home of the Silver Beach Amusement Park, is owned and managed by Berrien County. There is a nominal fee for daily parking or an annual pass can be purchased. There are concessions available at S.O.S. (Schu's On Silver Beach) consisting of soft drinks, fries, burgers, hot dogs, brats, cookies, etc. In addition to the concession stand, Silver Beach has a beautiful and well maintained sandy beach. Lake Michigan can be cool in early summer but from July until well after Labor Day the water is very comfortable for swimming. The lake water is fairly shallow making it fun to play in even for small children (with supervision of course!). 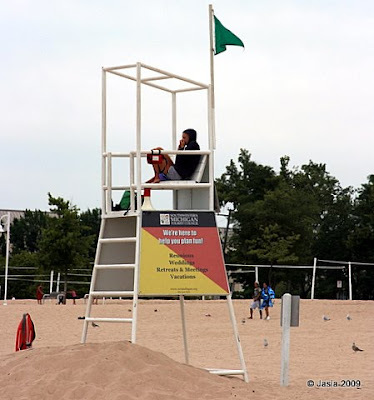 And there are two life guard chairs that are staffed during the days when the beach is open. You can bring your own food and beverages, chairs, umbrellas, etc. There are public restrooms and changing facilities available. Sometimes there are lines for the women's restroom but that's no different than many other public venues. The facilities are fairly clean and regularly maintained. If swimming is not your thing, don't despair! There are several beach volleyball nets set up on Silver Beach. Just bring your ball and your friends and have yourself some fun! Kids will enjoy all the playground equipment on the beach! 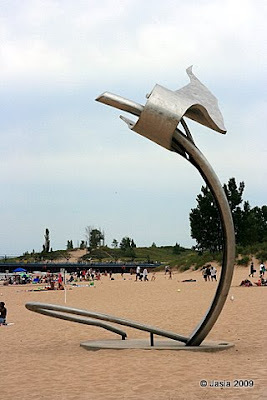 You can also stroll along the paved walkway and admire the art sculptures that line the area. There are several of them and they all add to the beauty that is Silver Beach. The South Pier is accessible from Silver Beach. The pier marks the southern shoreline of the mouth of the St. Joseph River. Often you'll find people walking, jogging, fishing, or just sitting along the pier. It provides a great vantage point for taking photos of boats going into and coming out of the river as well as the two lighthouses on the North Pier. The Shadowland Pavillion is located in Silver Beach Park near the St. Joseph River. There are concerts performed there from time to time including a concert and fireworks on the Fourth of July. When the sun gets low in the sky and another day at the beach comes to an end, you'll often find photography buffs flocking to Silver Beach to catch a beautiful Lake Michigan sunset. Like a moth to a flame, they come, cameras in hand. You'll also see them gather before an oncoming storm. The photo opportunities are wonderful and always different. Just this week I was down at Silver Beach three evenings in a row to catch the sunset. One evening was particularly windy and cloudy which made for dramatic waves and cloud colors. The next evening there were four kite boarders surfing just offshore up and down the beach. And last evening there was a pod of sailboats on the lake silhouetted by the late day sun. I was able to get beautiful and very different pictures of the sunset each day. Silver Beach has something for everyone. Which is a good thing because you can't always count on the beach to be open for swimming. When there are windy conditions at the beach it will often be closed because of the risk of potentially dangerous rip currents. Every year there are swimmers who don't heed the warnings and they get themselves caught in a current that pulls them out into the lake. It's not a good idea to ignore the warnings! It's easy to tell if there is a rip current warning because you'll see red flags flying from the lifeguard chairs and from places around the beach. foot waves at 10 am. pull... and then head back to shore. Heed the advisory. Play it safe. There is much fun to be had at Silver Beach. It's a great place on the lake. Enjoy!